I have been conducting the 7 Habits of Highly Effective People programme at work for goodness knows how many times now that I most probably can do it with my eyes closed. However, I soon decided that I have to be truthful when I share with the participants certain things like the Time Matrix. It is a matrix between what is important and urgent. 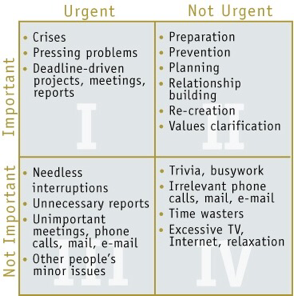 Quadrant 1 represents things that are important and urgent and it is labeled as the quadrant of Necessity. Quardrant 2 is a quadrant of Effectiveness, Quadrant 3 Distraction and Quadrant 4 Wastage. I have no problems talking about Q1, Q2 and Q3 but when I explained Q4 to the participants today and advising them to eliminate it completely, I had to admit to them that I find myself in that quadrant a lot of times these days, what with my current addition of Korean dramas. I am telling myself that it is not healthy to spend all my free time on it. I am missing my time on Q2 stuff like thinking and writing, reading and praying, journaling and connecting. I have to keep reminding myself to go slow with the TV programmes. With them all in iflix, they will never go away and will always be there to be watched, slowly, not all at one go. The thing is I have no problem watching the American and U.K. series in a good moderate pace, enjoying and savouring the stand alone episodes of shows like The Closer and Criminal Minds. It's the Korean dramas that is the culprit. All the usually 20-one-hour-episode dramas each make one story and I tend to watch several episodes if not all of them back to back. I need to divert myself and make time instead for the more useful stuff.